PPBU 2017 is offered to tertiary level education from Skills Certificate, Diploma, Bachelor’s Degree, Professional, Master’s Degree, and Doctorate and PHD to deserving Malaysian. Its aim is to aid the social and economic development of Malaysians by enabling bright but needy students to receive undergraduate education at local Public OR Private Higher Learning Institutions and Training Institutes in the country on a full-time basis. 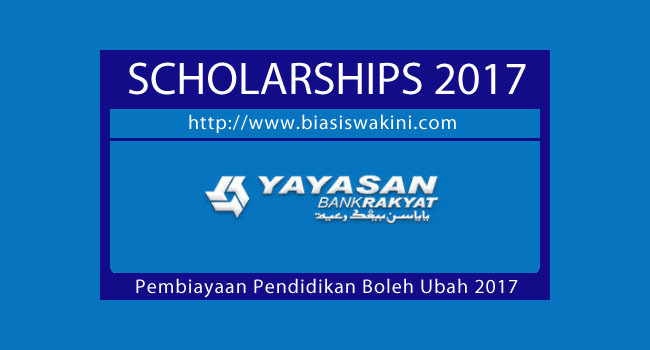 0 Komentar untuk "Yayasan Bank Rakyat-Pembiayaan Pendidikan-Boleh Ubah 2017"